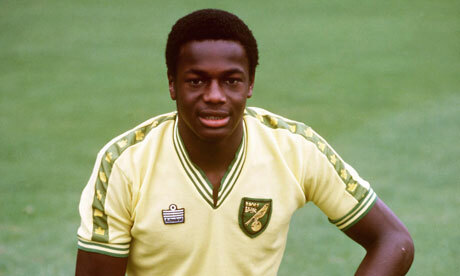 It’s over 20 years since Justin Fashanu came out as Britain’s thus far only openly gay professional footballer, and close to 14 years since he took his own life. He was also black, and I think it’s fair to say that the sport’s and indeed society’s attitude to race has improved markedly in the days since his career, which began in 1978. But why haven’t we seen the same changes in the game’s attitude to sexuality? Part of me wants to say that it really doesn’t matter – who cares whether anyone, be they a footballer or not, is gay, straight, bisexual or anything else? There’s probably somewhere in the region of 6,000 or so professional footballers in Britain, so it would represent a remarkable statistical anomaly if not one of them was gay. And as I say, in one sense there is the argument that they shouldn’t feel they have to tell anyone of their sexuality – it is, after all, a private matter. Unfortunately, our society doesn’t quite work like that and there’s near-constant speculation in the media over the sexual carrying-ons of all types of celebrities, not just footballers. It would undoubtedly be of massive public interest if a footballer were to come out, just like it was when former Wales rugby captain Gareth Thomas or occasional England wicketkeeper Steven Davies did. I was pleasantly surprised by the support both received from team-mates and fellow professionals, but I’m not sure it would quite be the same in football. Can you imagine the abuse a gay player would get from opposing fans every week? Indeed, the reaction British former NBA player John Amaechi (who only came out over retiring) received from some quarters suggests there is still some way to go, as difficult as it is to draw comparisons between the US and the UK on this issue. But given the total lack of evidence regarding footballers’ attitudes towards openly gay colleagues, it’s all we have to go on. Supporter attitudes do provide some clues, however, and unfortunately it seems to me that little has indeed changed since the time of Justin Fashanu. To a degree, I can speak from personal experience here as a supporter of Brighton & Hove Albion. Brighton, as you may or may not be aware, has a reputation for being the gay capital of the UK, something that many residents of all orientations are proud of, as it shows the city to be the diverse, tolerant and vibrant place that by and large it is. However, I’m not sure I’ve yet been to a Brighton match (and I’ve been to a lot) where I haven’t heard such witticisms as “we can see you holding hands” and “does your boyfriend know you’re here” from opposing supporters. “But it’s just banter!” I hear you cry. Well, yes, but it betrays the underlying point – that people see homosexuality as a negative and as something that it is acceptable to poke fun at. Just the other day, Brighton beat Newcastle United 1-0 in the FA Cup. It was a fantastic result, but it was somewhat troubling to read on a Newcastle fans’ forum that a contributor was upset because they’d lost to a “town full of gays.” Again, I’m sure the defence would be that it was just banter, but think about it. If Newcastle had been playing, say, Luton, would it be considered acceptable to say that they’d just lost to a “town full of Pakis?” Of course not – it would rightly be considered totally racist. So why is discriminating on the grounds of sexual orientation just considered “banter” by many, when in reality it’s no different whatsoever? There are maybe some small signs of progress – people have been arrested at recent Brighton games for some of the chanting I’ve described above, and organisations such as the Justin Campaign do sterling work in trying to eliminate this scourge from our society. But it just seems to me there’s not the will from the powers that be to tackle the issue. Recent events show that racism is rightfully not tolerated in any way within the game and indeed society as a whole, and the Kick It Out campaign deserves huge credit in this regard. It’s well-funded and massively publicised, but why is the Justin Campaign not given equal status? The Kick It out campaign attracts support from top managers and players, but not a single player was prepared to be associated with an anti-homophobia video, presumably because, as the article suggests, they weren’t prepared to risk ridicule. All this comes as Joey Barton, that most polemical of characters, declares that he’s certain there will be an openly gay footballer in Britain within the next decade. Much as I admire him for having the courage to speak about the topic, I can’t share his optimism. With virtually no progress made in the last 20 years at a time when every other kind of prejudice has been challenged within the game, what’s going to change so dramatically in the next ten? I’d love to be more optimistic, but I’m not sure if I can be. In the current climate, it would take someone quite exceptionally brave to tell everyone they’re gay.